Reem is responsible for assessing quantities and pricing for tenders and cross-checking material certificates for standards compliance. A role which is far from where her career path started – quite literally! Originally from Syria, Reem decided to study Civil Engineering. A decision driven by a natural interest and it’s popularity as a career for women in her home country. This took her to Abu Dhabi UAE for 16 years before immigrating to New Zealand to start a new life with her family in 2016! When she arrived in New Zealand she knew it would be challenging – but for her, that was part of the excitement. Settling in Hamilton where she now works at Modern Construction. Modern Construction is a fabrication and erection company specialising in design construction solutions and custom manufacturing products. A focus on adapting to industry demands allowing them to remain progressive for their target industry sectors and services. QS Estimator and QA Assistant Reem Soliman pictured on the Modern Construction workshop floor. Find out how New Zealand compares to the UAE for work as Reem shares her thoughts! So Reem, how have you found your job transition from civil engineering to steel construction? After graduating and starting my career I knew I’d made the right decision. One of my most memorable projects being the Al Wahda City / Grand Millennium Hotel in Abu Dhabi. Its scale was huge and had many special architectural and structural design and landscape aspects to it. With a contract value of approximately NZD$400m – it was an amazing experience being able to deliver to a high standard of FF&E works. But, that didn’t stop me from wanting to learn more! Which is why when I arrived in New Zealand I was excited to start my career in steel construction. An industry that was 100% new to me! With the support of my boss it’s been a great transition. Structural steel is an off-shoot from civil engineering and after 15 months on the job I feel more confident and have better understanding across my work responsibilities. Leveraging my numerical skills, I’ve been able to learn about structural elements, buildability and erectability of buildings. And, I’m looking forward to building my knowledge in fabrication and technical aspects of site work. 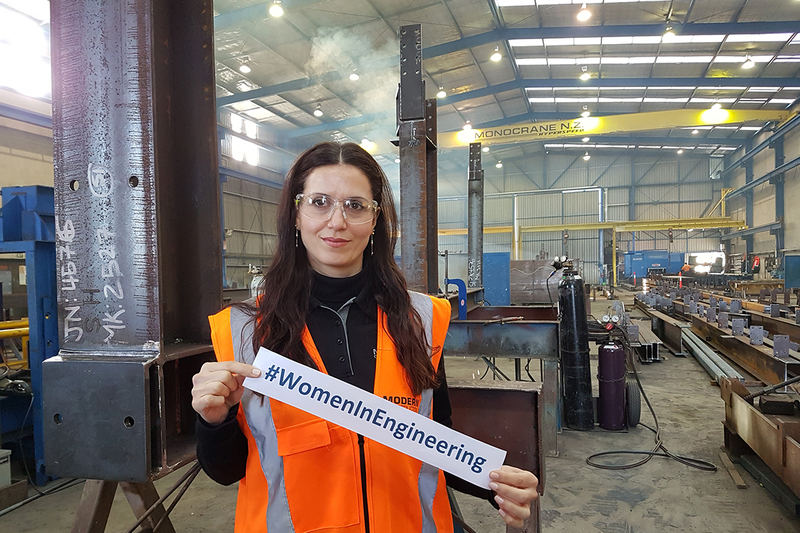 Would you like to see more women in engineering? Sure, why not?!!! I think nowadays we can’t segregate jobs between men and women. Today women are involved in all kinds of jobs. Their performance proves they’re capable! I think historically engineering has been perceived as a male domain. Schools need to show more effort to break this thinking. By encouraging girls to be more involved and to explore the idea of this career path. I also believe construction companies have a role to play too. This could be as simple as showing more interest to hire female engineers to be part of their teams and providing equal opportunities. At the end of the day – we all need work. Whether female or male, if you have a genuine interest in engineering then push yourself forward to follow your goal. Don’t limit yourself by other peoples perceptions. To me, engineering is a creative job with many options and specialties to pursue. Give it a go, and one day you could be a mechanical, electrical, structural, geotechnical engineer or similar!